During the cold months, many lakes turn over, which means the coldest water will be on the top, and the warmest water will be on the bottom. This condition is unlike the summertime when the warmer water is on the top, and the colder water is on the bottom. 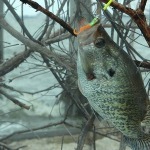 Because crappie are seeking a comfort zone, often they will be looking for that warmer, deeper water. But usually the slabs prefer some type of cover to hide in and hold on, so they can attack baitfish. 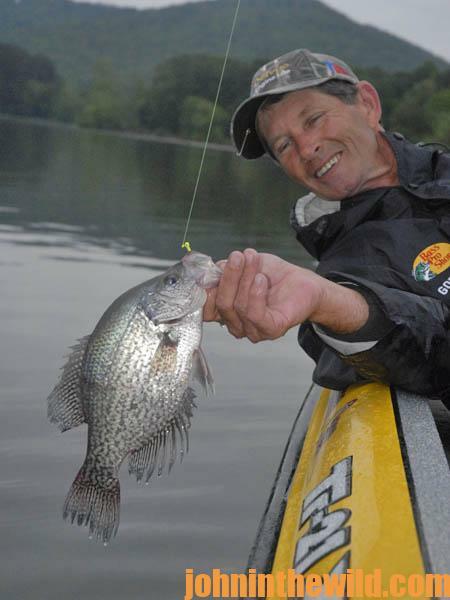 To pattern wintertime crappie, anglers must look for cover along the thermocline where crappie can concentrate. In many lakes and rivers, this cover may be on the edges of old creek and river channels and along stump rows where the warmer water is close to the bottom. 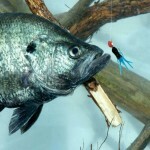 Remember that during the extreme cold of the winter months, the crappie’s body metabolism slows down. 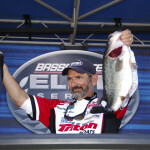 The fish won’t chase a bait as far as it will in the spring and summer. 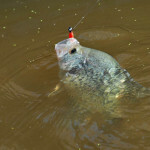 The crappie angler has to fish his bait slow and deep to get bites. Although trolling usually is not thought to be a slow method of angling, actually it can be as slow as drop-fishing. 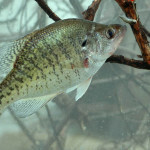 Many crappie anglers troll for crappie using crappie rigs with two minnows on them along underwater creek and river channels in cool-weather months. Most anglers generally consider trolling a technique for catching a bass or saltwater fish like sailfish and marlin, and in both of these types of trolling, the boat moves forward faster than what is required to troll for crappie. If you watch an effective crappie fisherman trolling, you may not be able to tell that his boat is moving. 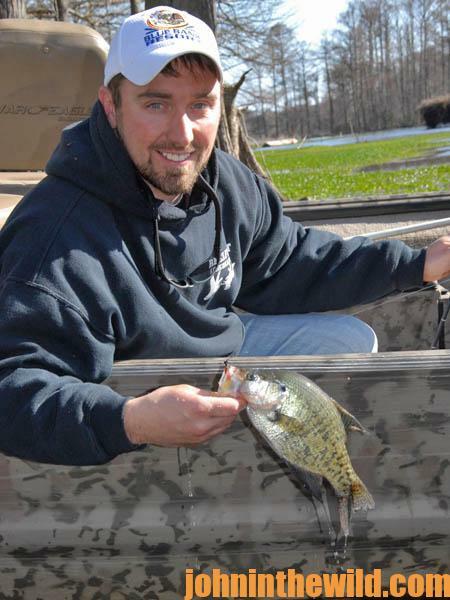 As one crappie guide says, “The slower you go, the more fish you catch.” A more descriptive term for cold-weather crappie trolling may be bumping. “I hit the trolling motor just enough to make the boat move slightly,” this same crappier explains. “When the boat comes to a full stop, my fishing partner or I will bump the motor again just to make the boat move forward 1 to 1-1/2-feet. Using this slow-trolling method, we are dragging the minnows right in front of the crappie’s nose. If the fish is there, it will take the bait. 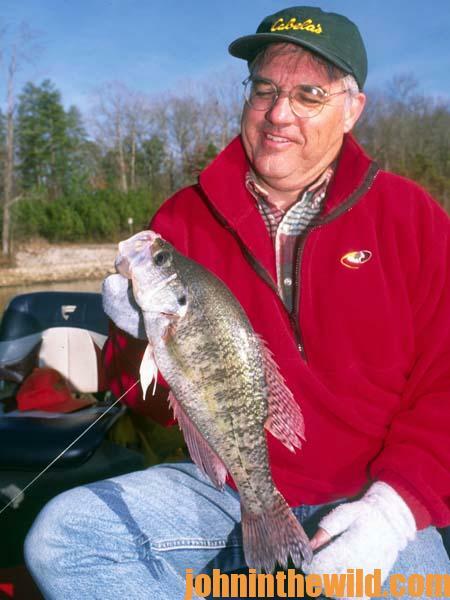 If we catch a fish, we attempt to stay in the same area and troll back and forth with our minnows to take more crappie out of the school.” On Lake Purdy near Birmingham, Alabama, wintertime crappie fishermen troll the creek and river channels using jigs and very light line – 2- to 4-pound test. 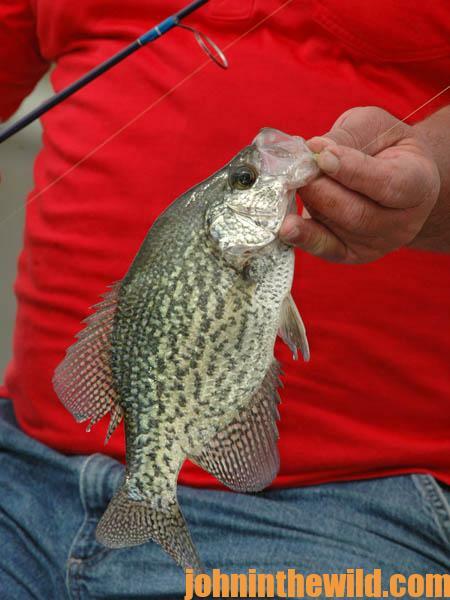 Although these sportsmen move slowly and fish deep, they catch plenty of crappie.